Got stacks of downloaded movie/audio/photo content you want to watch on your television, in HD quality? Well, so long as you don’t already own any of the systems with this sort of capability built in (Xbox360, PS3, etc) the LaCie La Cinema digital AV player could be of interest. computer operating systems released in the last few years cover this off nicely. However, if you are in the market for home media server/player, then I can see this could be a great product to add to your set up. 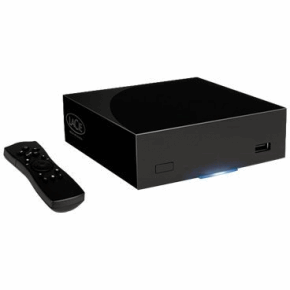 The LaCie La Cinema is a small (approx 12cm x 20cm x 4.5cm) shiny black box, that is sleek and shiny enough to feel nicely gadgety. It certainly wouldn’t impose in your average AV set up. Weighing under a kilo, and made of plastic, it feels very light, and slightly flimsy. It comes with HD connection cables, hi-speed USB and a remote control. Set up was a breeze, and we were watching content as soon as we’d ripped a dvd to it via pc. The biggest fault was immediately apparent though: the official website says, ” This user-friendly drive is fanless for silent operation ” – although it may be fan less, silent is not what I’d describe our unit as. Possibly a technical fault with our review unit, however, the high pitched squeal that came from the box from the moment it was plugged in and throughout use made it completely impractical for any viewing or listening use. Think of that high pitched “eeee” ringing you get in your ears sometimes after a gig the next morning. Yep, it was like that. stop. No idea why it would do that, for a unit that is purely for ease of consuming content on, this would be a no go for me. Another quirk of our box was a strange intermittent blue screen popping up, happened twice during a 3 hour test, once when viewing photos and once during video content playback. It wasn’t a deal breaker, but if I’d bought the box and that happened, I’d be concerned. A final deal breaker for me was the fact that even though I set our dvd to rip in surround sound, the unit was unable to play back our rip in anything other than 2 speakers. There may have been a setting I didn’t work out, but if that’s the case it was well hidden. Over all, despite the technical hitches, the concept of the box and in theory what it is capable of seemed great. I’m tempted to be kind, and assume the problems we had were due to our unit being a review unit that had been transported a few times between reviewers (according to the state of the box it turned up in). In conclusion: if you don’t already have a home media server and player setup, the LaCie La Cinema digital AV player could be of interest, but I’d recommend checking out the competition first. For the price (currently £154.99 inc VAT for a 1TB unit) it’s a well priced solution, that looks good and is simple to use. However, be prepared for potential technical issues. Next Next post: Off Topic: Sackboy Merchandise – Finally!